Anglican worship in Wolfeboro, the Oldest Summer Resort in America, dates back to the days of Colonial Governor John Wentworth, who held services in his home on the shores of what he called “Winnipiscohet Lake” [now Lake Wentworth] in 1769. Ended by the American Revolution, Episcopal worship returned in 1888 and was taken over by the Rev. William Emery of the Sanbornville, NH parish in 1890, and Professor Terrill of Brewster Free Academy with occasional services. This established a firm relationship between the congregations of Wolfeboro and Sanbornville. In 1928, the “Women’s Auxiliary” opened a thrift shop on Railroad Avenue. Church services and Sunday school were held in the First Congregational Church. In the late 1930’s the church services were moved to a vacant community church building in South Wolfeboro with the Reverend Andrew Van Dyke conducting the services. 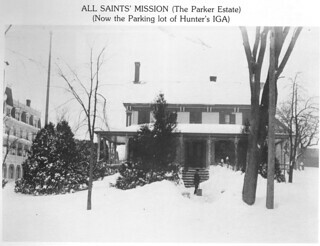 The first parish owned building, the former Parker House, was purchased in 1943 and All Saints was admitted as a mission by Bishop John T. Dallas [1926-1948]. 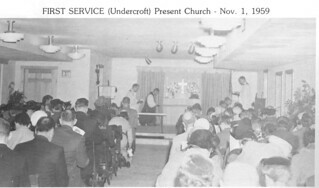 The first service was held on all Saints’ Day, November 1, 1944. Originally called the Parker House, the building was located on the corner of South Main Street and Glendon Street where the Hunter’s parking lot is located. In 1952, the Reverend Lewis Coffin became the first resident priest. In 1958, the Parker House building was sold and the site of the current building on South Main Street was purchased. 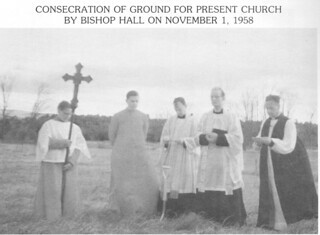 Bishop Charles F. Hall [1948-1973] officiated at the deconsecrating. Ground was broken for the current church on All Saints Day. The new building was designed by noted Norwegian architect, Gustav Hagen. During construction of the new building, services were held at the First Christian Church on North Main Street. It was completed in time for Bishop Hall to lead the first service in the building on All Saints’ Day in 1959. In 1960, Father Coffin left and supply clergy filled in. One of the noted supply priests was the Reverend John Walker of St. Paul’s School in Concord, NH who, before his death, became Dean of the National Cathedral and later Bishop of Washington, DC. In 1961, All Saints held its first Summer Fair which continues to this day. In 1965, The Reverend Donald Wilson became Vicar and lived in the new rectory on Green Street. 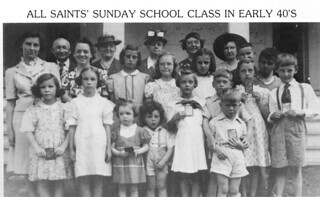 The 1970’s produced many changes in the life of the parish. In 1971, the church was elevated to Parish status. In 1972, the Diocesan Convention was held at All Saints for the first time. In 1977, Father Wilson left to accept a call in South Dakota. In 1978, the rectory was sold in anticipation of the next clergy family wishing to purchase their own home and the Reverend Randolph K. Dales was called to be the second rector of All Saints Episcopal Church. The 1980’s also produced many changes in the life of the church. In 1980 the sanctuary was renovated and enlarged and the original plans for future growth were initiated with the completion of a new wing to house the Church School rooms, a library, a nursery a choir room, and a children’s chapel. In 1981, All Saints was instrumental in forming a Hospice in the Wolfeboro Area, later to become part of the Visiting Nurse Association. Also that year the mortgage for the original church taken out in 1959 was burned. In 1983, the undercroft of the main church was renovated and the original stage was removed. Walls were erected and the first location for the new Lord & Tailor Thrift Shop, initiated by parishioner DeDe McBeth, was completed. All Saints was also instrumental, with other churches in town, to start the food pantry known as L.I.F.E. Ministries Food Pantry. In 1984 the organ was replaced and All Saints participated in a “Rector Exchange” with York, England. In 1986, All Saints hosted the Diocesan Convention for the second time which was Bishop Douglas E. Theuner’s first convention in New Hampshire. Also in 1986, the mortgage was burned for the first major addition built in 1980. A refugee family was sponsored and housed by All Saints in 1987 and Caregivers of Southern Carroll County was formed through the initiation of Shirley Bentley. In 1989 the kitchen was renovated and expanded with new cabinets, dish washer, and appliances and the Rector took a sabbatical to the Holy Land. Food PantryIn 2000, the L.I.F.E. Ministries Food Pantry moved to the old Church of the Nazarene and All Saints volunteers, in conjunction with the Rotary Club, provided the renovations. Our first mission church to El Salvador occurred in 2001. The New Hampshire Diocese celebrated its bicentennial with the support of All Saints’ under a large tent on the campus of Brewster Academy in 2002. The first Youth Mission to Philadelphia occurred in 2003, in 2004 they went to Antonio, and Biloxi in 2005. In 2006 we had our first deacon, Susan Langle, who was ordained in 2007 and answered the call to be Rector of Trinity Church in Claremont, NH. Lord & TailorTo continue the outreach efforts of the parish, the new All Saints Outreach Building was built in 2008 to accommodate the L.I.F.E. Ministries Food Pantry, the Lord & Tailor Thrift Shop, and the Welfare Office for the Town of Wolfeboro. In 2009, in order to house the expanding needs of the parish, the second wing was completed, thus finishing the original 1958 design of the church. In the Spring of 2012, our Rector of 34 years, The Reverend Randy Dales, announced his retirement effective July 1st - a major change in the life of the church. On July 1, 2012 we welcomed transitional Rector, The Reverend Ted Rice who served All Saints' for two years. On August 1, 2014 we welcomed The Reverend Bill Petersen as the third Rector of All Saints.